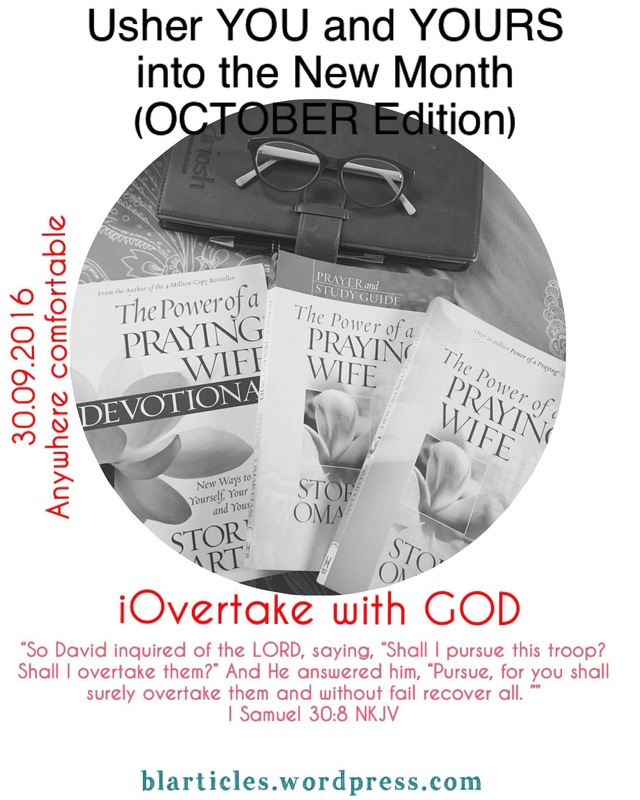 I invite you all to another episode of the “Usher YOU and YOURS into the New Month” series. For those who joined in last month, my sincere prayers is that God Almighty, the maker of all things and all men will visit you and yours even in these remaining days of this month. With all thanks to God for bringing us to the last days of the 9th month of this year 2016 which also marks the end of the 3rd quarter of this year, I strongly welcome you to the last quarter of this year. Like my mentor once preached and I quote “Your Mouth Determines your Miracle.” I admonish you all that while you ask God for those heart desires of yours, while you declare and decree his promise over you and yours; don’t allow your own mouth reverse what you have confessed. It’s one thing to pray and believe and it’s another thing to patiently wait for the manifestation. Reading through the verses, when the enemy took from King David, he didn’t just jump up, assemble his army and start pursuing. He understood what it meant to do battles with God, so he didn’t just pursue the Amalekites blindly. He did with an understanding and that was as a result of God’s affirmation that yes He would overtake them. I want everyone of you joining in, men and women, young and old to do this with an understanding. Do not wait till you have lost everything before you run to God. Run to God so you don’t lose anything. I won’t be listing out any prayer request. Pray as you are led. Tell your friends about this, share it to as many as you can and God will send answers to every of our prayers in Jesus Name. Amen.